A brief digression on parrots. The parrots comprise a large order (Psittaciformes) of birds with a mainly pantropical distribution, although some species do inhabit temperate regions in the Southern Hemisphere as well (e.g. the burrowing parrot, Cyanoliseus patagonus, of southern South America). Number of species reported varies but generally is on the order of 340 to 370 distributed across between 78 and 86 genera (Rowley and Collar 1997). Characteristics of parrots will be familiar to most: robust, curved bill, strong legs with zygodactylous feet (two toes forward, two toes facing backward). Many are brightly-coloured although some, like the sulfur-crested cockatoo (Cacatua galerita) are mostly white, while others, like the flightless Kakapo (Strigops habroptila) of New Zealand, have muted and cryptic plumage patterns to avoid predators. Northern rosella taken in Litchfield National Park. Click on thumbnail for larger image. In my still unfolding peregrinations in Australia I have already seen 10 species of parrot including this lovely northern rosella (photo by Cam Hudson – see his blog – from some distance – but still showing some of the vibrant colours). Gallah taken just outside Nitmiluk National Park. Click on thumbnail for larger image. Unfortunately, at least 80 species of parrot are classified as vulnerable or endangered (IUCN 2013) due to a mixture of habitat loss, collection for the pet trade, and persecution because some are considered agricultural pests (Collar 2007) with some already extinct. Indeed, the only psittacid of Eastern North America went extinct in the early 20th Century. The Carolina parakeet (Cacatua galerita) once ranged from southern New York, south to the Gulf of Mexico and as far west as Nebraska (Snyder 2004). The Carolina parakeet was a lovely species, with bright yellow head, orange face, green body and pale bill (see John James Audubon’s rendering here). One can imagine that, before European settlement (and ensuing loss of the Eastern deciduous forest, persecution because it foraged on orchards, and hunting for the millinery trade – nothing like a stuffed parakeet on your hat I guess – see Saikku, 1990), very occasionally one might even have seen a northern vagrant parakeet in Canada. Collar, N.J. 2007. Globally threatened parrots: criteria, characteristics and cures. International Zoo Yearbook 37: 21–35. IUCN 2013. IUCN Red List of Threatened Species. Version 2013.2. <www.iucnredlist.org>. Downloaded on 22 January 2014. Saikku, M. 1990. The extinction of the Carolina parakeet. Environmental History Review 14: 1-18. Snyder, N.F.R. 2004. The Carolina Parakeet: Glimpses of a Vanished Bird Princeton University Press. Princeton, NJ. Any day now the skies over Eastern Ontario will begin to ring with the calls of Red-shouldered Hawks (Buteo lineaus). This vocal hawk is one of the most commonly encountered raptors on the Frontenac Arch. It’s also one of the few forest raptors that have been subject to long term monitoring in Eastern Ontario. Beginning in 1991 the Red-shouldered Hawk and Spring Woodpecker Survey has been conducted each year along Opinicon Road in an effort to keep track of Red-shouldered Hawk numbers. In this post I summarize the results of 20 years of counting Red-shouldered Hawks along Opinicon Road. The counts were completed by Ron Weir and others. Thanks to Ron for providing me with the survey data. The results of the Red-shouldered Hawk surveys show that there has been a significant increase in Red-shouldered Hawk numbers since 1991 (P=0.0013). The lowest count was 5 birds in 1992. The highest count was 27 birds in 2003. The mean count is 17.05 birds. Red-shouldered Hawk numbers across their Ontario range appear to be steady or increasing and the data from Opinicon Road matches this trend. QUBS is situated in what is currently the heart Red-shouldered Hawk abundance in the province (Cadman et al 2007). The largely intact forests that cover our part of the Frontenac Arch provide habitat for these sylvan raptors and are likely the reason for the high numbers recorded here. Red-shouldered Hawks may have been far more abundant than they are today all across Ontario prior to the conversion of forests to farmlands (Weir 2008). The species continued to decline in the mid 1900’s. In 1983 the Red-shouldered Hawk was designated a species of concern in Canada, due to the large declines in populations associated with forest clearing. In 2006 it was reclassified as not at risk. Today the most commonly observed hawk in the region is the Red-tailed Hawk (B. jamaicensis). It prefers large tracts of farmland or other open terrain. It has probably replaced the Red-shouldered Hawk throughout much of southern Ontario as a direct result of habitat alteration. However, at QUBS Red-shouldered Hawks remain more numerous than Red-tailed Hawks on most of our tracts. Figure 1. Number of Red-shouldered Hawks counted along Opinicon Road during the Red-shouldered Hawk and Spring Woodpecker Survey (1991-2010). 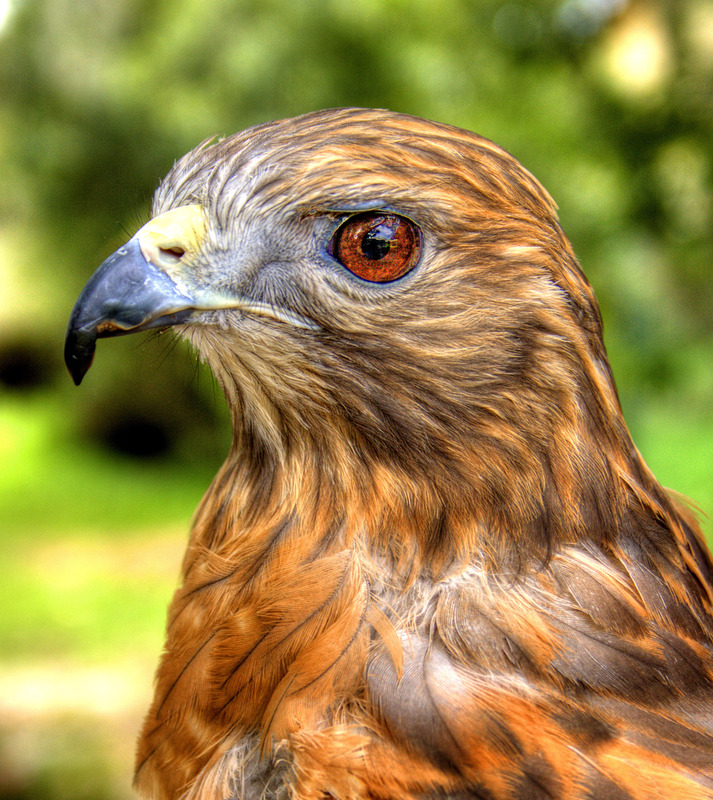 There is a significant increase in the number of hawks counted between 1991 and 2010 (P=0.0013). Cadman, M.D., Sutherland, D.A., Beck, G.G., Lepage, D. and Couturier, A.R. (editors). 2007. Atlas of the Breeding Birds of Ontario, 2001-2005. Bird Studies Canada, Environment Canada, Ontario Field Ornithologists, Ontario Ministry of Natural Resources and Ontario Nature. Golden-winged Warbler (Vermivora chrysoptera), Prairie Warbler (Dendroica discolor), Cerulean Warbler (D. cerulea), and Louisiana Waterthrush (Parkesia motacilla). QUBS has also been a hub of avian research for decades, especially for species like Tree Swallow (Tachycineta bicolor), Black-capped Chickadee (Poecile atricapillus), Golden-winged Warbler, Yellow Warbler (D. petechia), Cerulean Warbler, American Redstart (Setophaga ruticilla) and Red-winged Blackbird (Agelaius phoeniceus). Though the breeding season provides the best birding and is the busiest research season, occasionally interesting and unusual birds show up at QUBS in the winter. This year we’ve had our fair share of notable species including an unseasonable Winter Wren (Troglodytes hiemalis) and a juvenile Golden Eagle (Aquila chrysaetos). But the bird that has attracted the most attention is a Hornemann’s Hoary Redpoll (Carduelis h. hornemanni) which has been visiting bird feeders at QUBS Point on an almost daily basis since February 9, 2011. This 14 g songbird has brought birders from as far away as Pennsylvania, Connecticut, Washington DC and New Jersey. To understand why a Hornemann’s Hoary Redpoll should be so popular among birders it’s necessary to know a thing or two about redpoll taxonomy and natural history. Redpolls are small finches that breed in the high arctic and subarctic and spend the winter mainly south of the tundra throughout North America and Eurasia. There are two species redpolls in North America, both of which breed in low numbers in northern Ontario and winter in southern Ontario in most years. Redpolls are irruptive during the non-breeding season, which means that in some winters there are lots of redpolls and other winters there are few or none in Eastern Ontario. Annual fluctuations in redpoll numbers are usually correlated with fluctuations in the abundance of food sources, typically birch (Betula spp.) seeds. When seed crops are poor in the boreal forest, redpolls wander south in search of other foods including fodder from birdfeeders. Whenever redpolls are present, Common Redpoll (C. flammea) is the most abundant species, while Hoary Redpolls (C. hornemanni) are far rarer, so they attract quite a lot of attention from birders when they appear. Both of the redpoll species are comprised of two subspecies (in North America). There is the Southern Common Redpoll (C. f. flammea) and the Greater Common Redpoll (C. f. rostrata); and there is the Southern Hoary Redpoll (C. h. exilipes) and Hornemann’s Hoary Redpoll (there are a wide variety of English names applied to each of these subspecies so it pays to know the scientific names too). The Southern Common and Southern Hoary Redpolls breed across the southern Canadian arctic and subarctic. Greater Common and Hornemann’s Hoary Redpolls breed further north, on Baffin Island, Greenland and in the case of Hornemann’s up to Ellesmere Island! Of the four subspecies, Hornemann’s is certainly the rarest in Ontario. It is only reported in some winters, particularly when there are large irruptions of redpolls. It’s not uncommon to find both species of redpolls in the same flock, and sometimes three or even all four subspecies can be found together. This winter we’ve recorded all four of the redpoll subspecies at QUBS. Southern Common Redpolls are by far the most numerous with flocks sometimes in excess of 100 birds. Greater Common Redpolls and Southern Hoary Redpolls are seen singly or in pairs within these large flocks. The single female Hornemann’s Hoary Redpoll always appears with other redpolls where it can be easily recognized by comparison with other birds. Compared to the others the Hornemann’s Hoary Redpoll has whiter plumage, less streaking on sides, nearly all-white undertail coverts, more robust head and neck, smaller beak and is noticeably larger. Its rarity, its size and its extreme northern breeding habitat make Hornemann’s Hoary Redpoll an attractive target for birders, hence the many visitors we’ve received at QUBS in the past two weeks. Redpoll identification can be difficult; in fact it is one of the most challenging identification problems birders face. Direct comparisons between individuals can be helpful and it is necessary to clearly see all field marks in order to properly diagnose which species or subspecies a redpoll belongs to. A good summary of redpoll identification by Ron Pittaway can be found at http://www.jeaniron.ca/2007/Redpolls/redpolltext3.htm. For the third winter in a row a peculiar Canada Goose (Branta canadensis) has put in an appearance at Chaffey’s Lock. I first saw this uniquely patterned goose (see picture) over a number of weeks at Chaffey’s Lock in the winter of 2008-09. I subsequently found it paired with a normal-plumaged Canada Goose on a beaver pond in the remote northeast corner of the Massassauga Tract where it was present with its mate and a brood of four goslings in May 2009. In the winter of 2009-2010 I saw it only once at Chaffey’s Lock. The bird was again present among 26 other Canada Geese on December 16, 2010. The aberrant plumaged goose that has been frequenting the QUBS region for the past three years. This photo was taken on the Massassauga Tract in May 2009. Photo: Mark Andrew Conboy. Click on image to see larger version. Aberrant plumage such as in this goose, can be the result of many factors including hybridization, leucisim, albinism, malnutrition and injury. But it can be difficult to say confidently what the cause of strange colouration in individual birds is without close examination in the hand. Although Canada Geese will hybridize with Snow Geese (Chen caerulescens) to produce offspring that have dark and light patches of plumage, this particular bird doesn’t match the typical hybrid plumage or bill shape very well. That this bird sports the same odd plumage each year suggests that it’s not the result of malnutrition or an injury to growing feathers. Perhaps this goose is either partially leucistic or partially albino. Lecucisim is when a bird lacks black pigment in its feathers. Albinism is when a bird lacks all colouration in the feathers and other tissues. Without a closer look at this goose it is hard to say which of the two it might be, but the pink bill and snow-white feathers suggest a partial albino. A more typical appearance for a leucistic Canada Goose is to have feathers that are not so white but instead are a washed-out brown. Although colour variations such as albinism are not extremely rare in Canada Geese, this bird is an interesting one because its distinctive plumage means that it is possible to glean some information about the life history of a single bird, even if it is only in glimpses from time to time. The Cerulean Warbler is now a federally endangered species. QUBS is one place in Ontario where this species is actually still rather common. Photo: Philina English. Click on image to see a larger version. The Cerulean Warbler (Dendroica cerulea) is emblematic of QUBS and the southern Frontenac Arch. It has been the subject of research at the biological station since the 1990’s and indeed much of the basic natural history knowledge biologists have about this canopy-dwelling bird is the result of field work done right here at QUBS. In addition, hundreds of birders flock to Opincion Road and the area around Frontenac Provincial Park every spring to tick this species off their checklists. Cerulean Warblers are therefore a big deal to those of us who live, work and play in this part of the Arch. It’s therefore worth noting that Cerulean Warblers are now classified as endangered in Canada. The Committee on the Status of Endangered Wildlife in Canada (COSEWIC) is the governmental body that assesses the conservation status of species in Canada and recommends them for protection under federal species at risk legislation. In November COSEWIC reassessed the status of Cerulean Warbler and upgraded it from a species of special concern to an endangered species. The previous designation (special concern) was conferred in 1993 and reassessed as such in 2003. A species of special concern is one that has not yet become so severely imperiled as to be considered threatened (yet another official level of classification) or endangered but could become so if certain risk factors are not mitigated. Classification as endangered is far more serious and means a species is “facing imminent extirpation or extinction” in Canada (see COSEWIC). There are a number of factors that make extirpation a realistic possibility for Cerulean Warblers. Logging, forest degradation and fragmentation in the wintering habitat (the South American Andes), the apparent rarity of suitable breeding habit in Canada, and continued rapid population decline throughout much of its range since the 1960’s are all cause for grave concern. COSEWIC reports that there are an estimated 1000 Cerulean Warblers breeding in Canada annually. Intensive field work in May and June this year estimated about 100 breeding pairs (200 individuals) at QUBS. If those estimations are correct then lands owned by the biological station are home to 20% of Canada’s Cerulean Warbler population. The importance of our mature forest tracts which, Cerulean Warblers use for breeding cannot be overstated. Cerulean Warblers are now classified as endangered on a national scale but still only as special concern provincially; even though nearly the entire Canadian population of Cerulean Warblers breeds in Ontario. However, reassessments of species at risk are ongoing at the provincial level so their classification may or (may not) come into line with the federal list. For an explanation of how the federal and provincial species at risk lists differ click | here |.